“I’m sure plenty of people will have a problem with it, but I built it for me not them,” say the bike’s builder. In the age of social media, everyone has an opinion on absolutely everything and if your work involves creative endeavour then chances are you’re copping twice as much abuse. But award-winning painter Kacey Elkins of Krossover Customs in Stanford, Kentucky is having none of it. 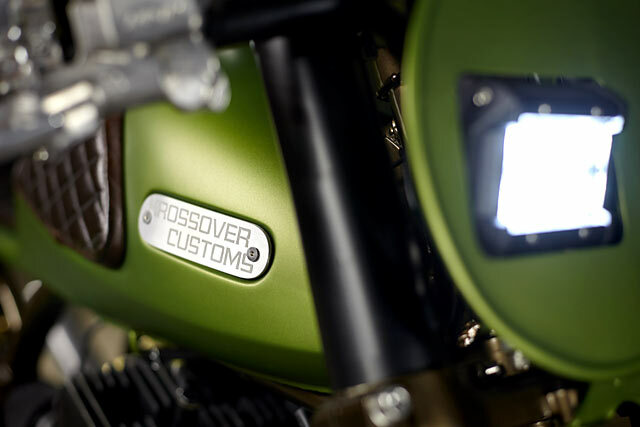 He spends his days keeping his clients very happy, so when it came time for an after hours motorcycle project it was going to be built exactly to his own desires. 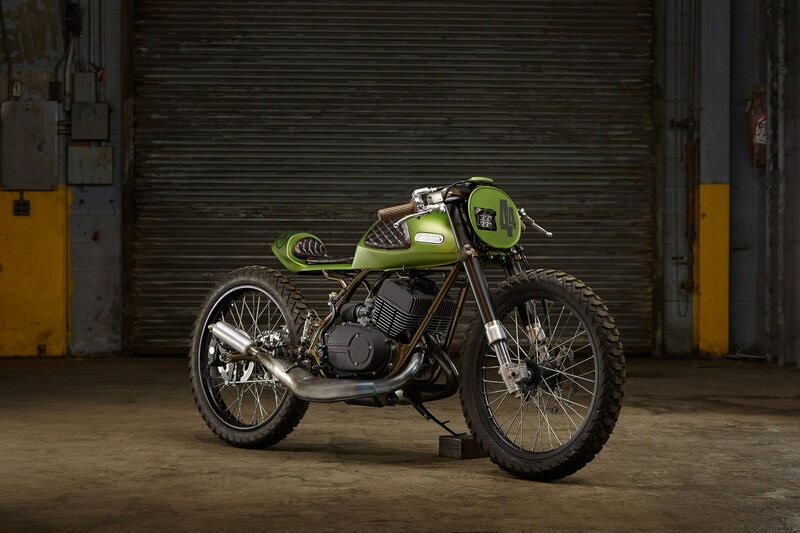 Straight out of Bourbon country is Batch #44, a 1973 Yamaha RD350 Cafe Tracker with a rich, smoky flavour, Absinthe palate and raspy aural tones. 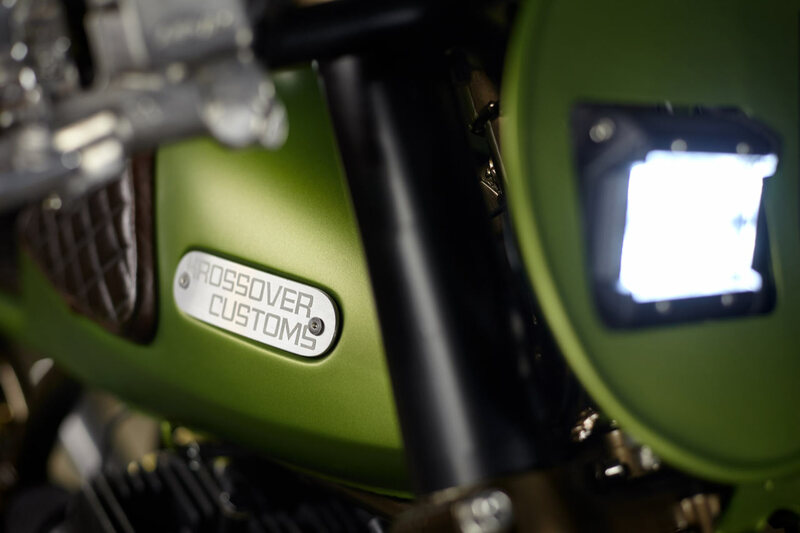 Despite the incredible custom that sits before you Kacey explains that while bikes are his passion, it’s not what he spends the majority of his working day doing at Krossover. 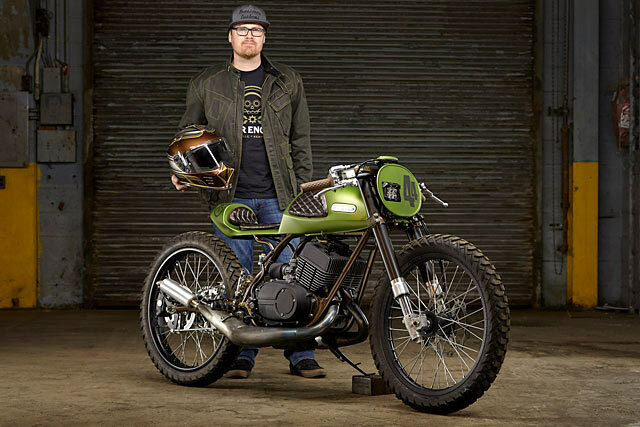 “I’m a custom painter and restoring cars is 90% of what I do, I also get to paint helmets here and there but my heart is always in motorcycles. 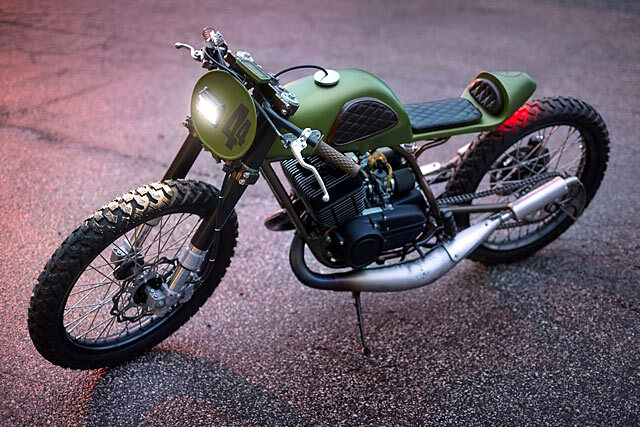 My life has always had bikes in it from racing motocross, to Harleys on the street.” Now what his heart desired was a 2 stroke for the road and the best way to make it happen was to build the bike himself. All of which had to be done in his spare time while still giving his wife the attention she deserves. Could it look any lighter? 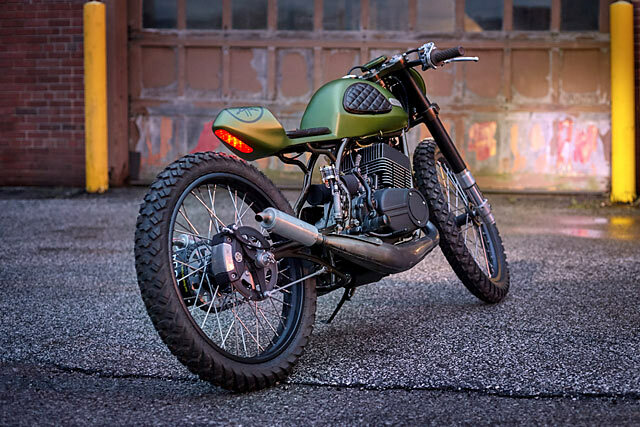 As luck would have it, the motorcycle Gods were looking down on Kacey and he’d make a connection that would kick-start the project. “I met PJ Grakauskas at the Kentucky Kick Down, we got to talking and he had a motor that needed a rebuild and a frame with a title . He needed paint work so we traded out. 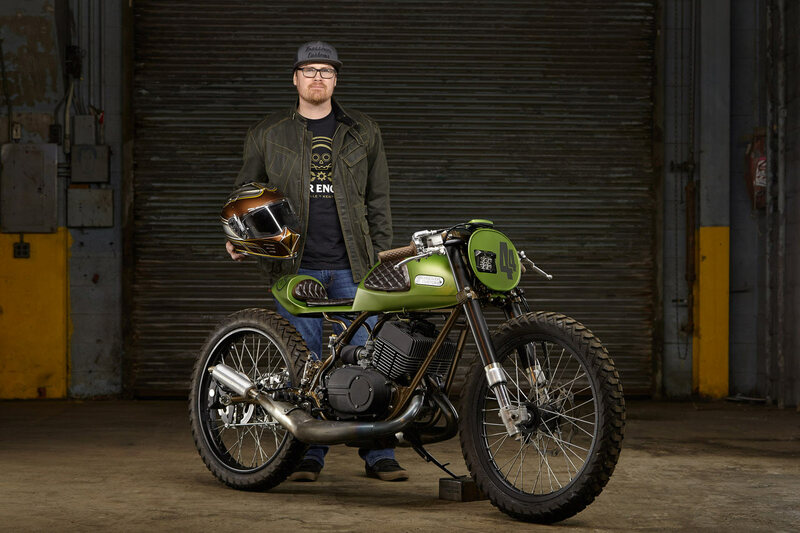 PJ lives in Cleveland so he met me halfway months later and I got started on the bike.” The idea was to design the Yamaha around the classic RD engine, keeping things as Elkins describes as “small, skinny and fast”. To do that the first modification to the frame came at the rear with a swingarm that would allow an under-slung shock like the older Buell models. With the rear nothing like the way it left the factory the front end required the same and a set of forks from a Honda CR125 provide the hardware. 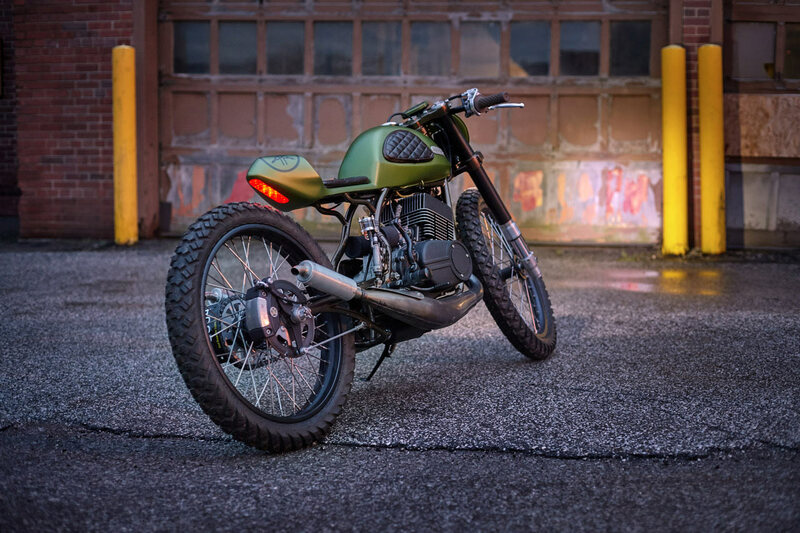 The stock Honda triple trees are retained to make the conversion, while the internals are considerably lowered for just the right ride height and on road manners. A 21″ Pro wheel has been laced up and fitted with a wave pattern big brake kit the un-sprung weight is kept to a minimum. 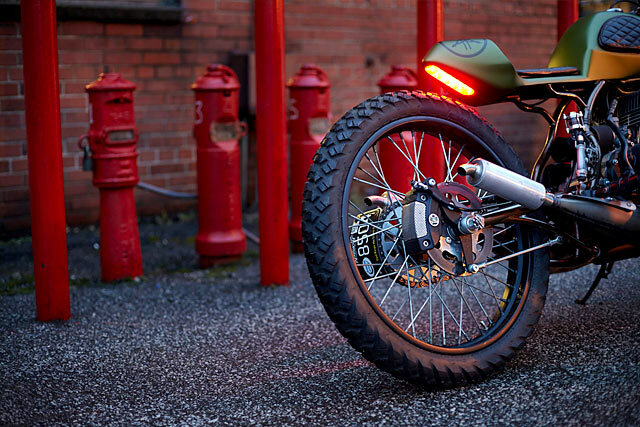 To get the matching look at the rear Kacey took a 21″ narrow wheel and mated it to a Harley hub. Then for the controversial part of the build, “I’m not really sure why I wanted aggressive tyres on it but I love them!” proclaims Kacey. Given how easy tyres are to change, it is a wonder they always ruffle the public’s feathers who won’t be the ones slinging a leg over. 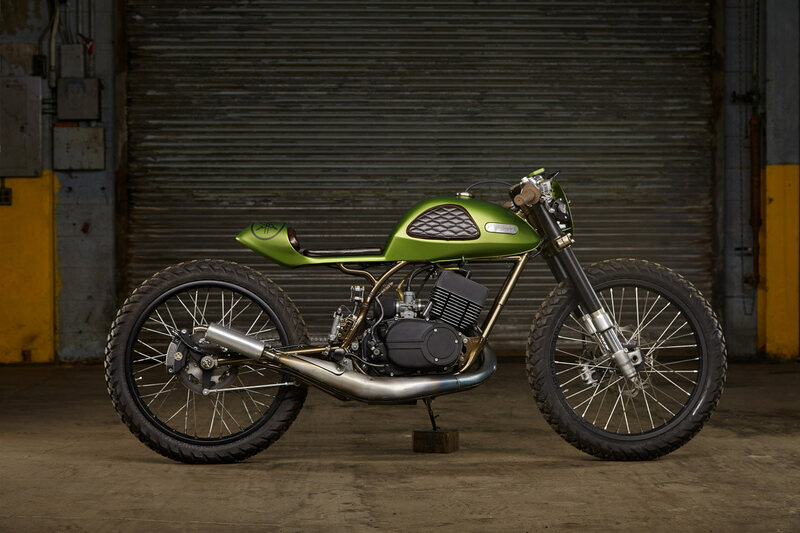 But there was no time to waste and with the rolling chassis nearly done modifications were made to the main frame that would allow for the fitment of an unconventional tank choice. However before it could be given its own unique colour the final modification was to the subframe that allows the tail to almost float in mid-air. 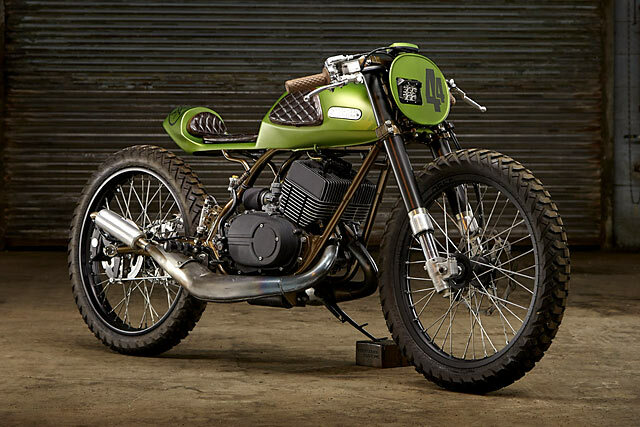 That tank comes from the Yamaha family in the form of the small but space age looking for its time Twin Jet. Kacey fired up the grinder and cut it to suit and then began working on the rear section so it would work with his next trick. A single piece body; the cafe racer style tail section merges seamlessly with the tank creating clean, unbroken lines front to back. The sculpted end of the tail gives the RD that slim line look with the frenched in LED light doing nothing to disturb the balance. 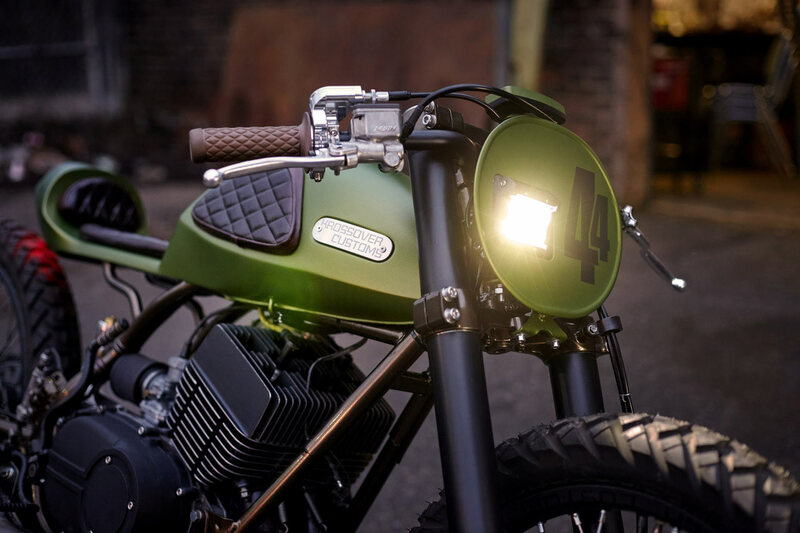 The front uses a number plate with an LED fog light mounted offset to serve as the headlight and allow the #44 graphic room on the other side. But that is just where the visual appeal starts; back to what he does best Kacey returned to the liquor cabinet and proves you don’t have to go glossy to pack a punch. Flawlessly laid down is the matte Vert Absinthe Green that brings a little Swiss hallucinating high society to good ol’ Bourbon country. 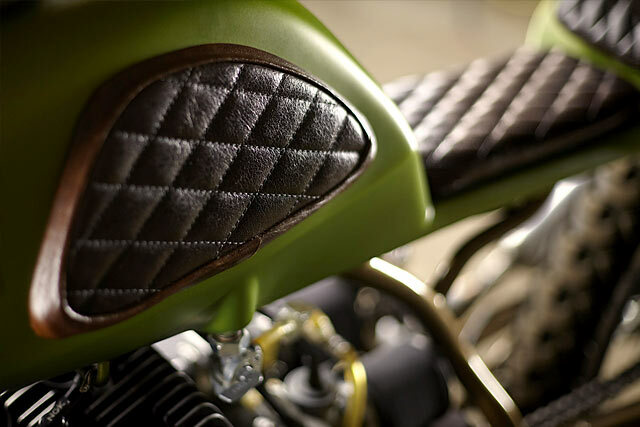 The colour is perfectly complemented by the diamond stitched brown leather seat and knee pads put together by local shop Stanford Upholstery. 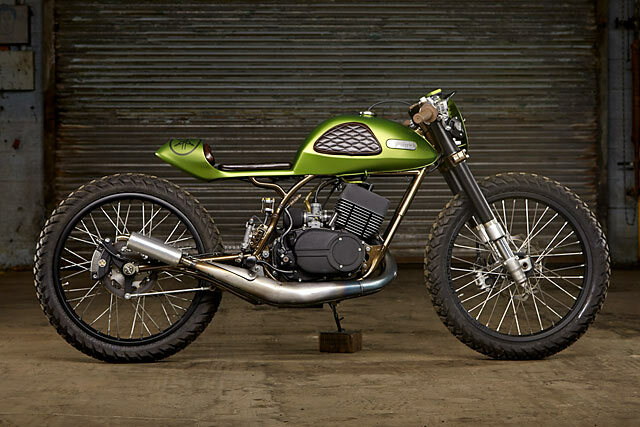 But for all the wonderful details, the heart of Batch #44 was always intended to be Yamaha’s screaming 347cc air-cooled, parallel twin, 2 stroke engine. But first, like just about any old smoker, it had to be rebuilt and given a full overhaul before it could be fired into life. The engine and its cases are finished out in an understated flat black with just the metal of the fins left exposed. With no place for an airbox on such a build the Mikuni carbs draw oxygen through twin pod foam filters. But it’s the FPP pipes we all came to see; these had to be modified to work with the new shock setup, but once finished out with Pro Circuit silencers this ring a ding ding was ready to sing. 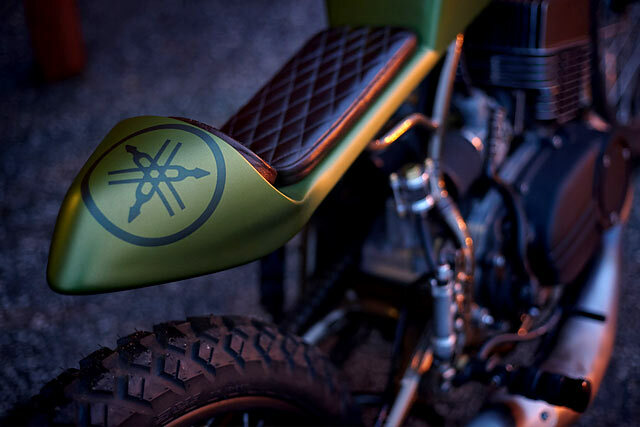 Keeping control of it all the clip-on bars get a set of grips with seat matching diamond pattern and an all new master cylinder to power the front brake. Having ditched the rear hub Kacey went all the way and converted the rear end to a disc brake setup too, with an incredibly neat conversion from pedal to pad. Keeping clutter to a minimum the only instrumentation is a Trail Tech gauge with the surround splashed with a little more Absinthe. So what she like? “My favourite part of this Yamaha is definitely the ride! It’s so fun when you hit that power band! 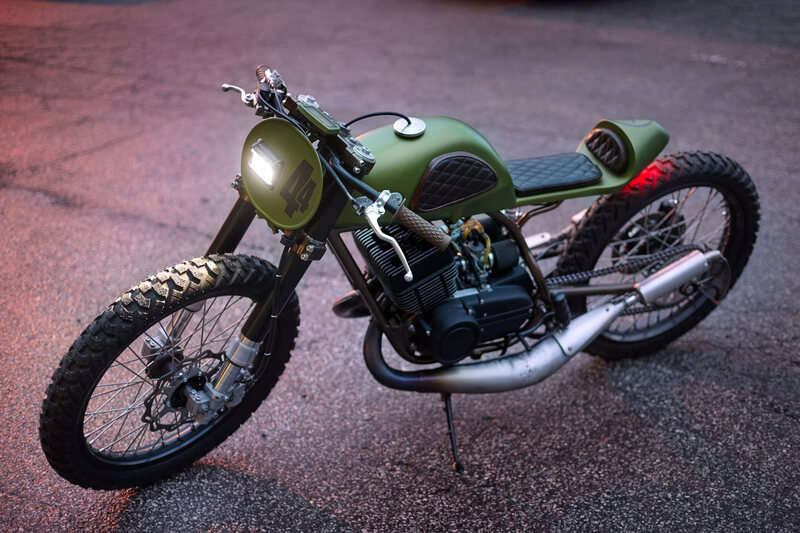 Also, the looks people give you at every stop light.” Made in his spare time with all the right ingredients, this custom cafe tracker breathes new life into a much-loved smokey rebel. Meaning Krossover Customs Batch #44 is a Kentucky creation that’s definitely good enough to bottle.